I love cooking in the kitchen, which means the tot loves to “cook” in the kitchen. I’ve been searching for a really fun interactive kitchen for her to play with that isn’t all plastic-y or super expensive (you know, those all wood ones). I’d seen some really cute ideas for how to make your own using an old side cabinet, but didn’t have one hanging around nor wanted to frequent the stores searching for a used one. So, the other day, the answer came to me when we received something from UPS. 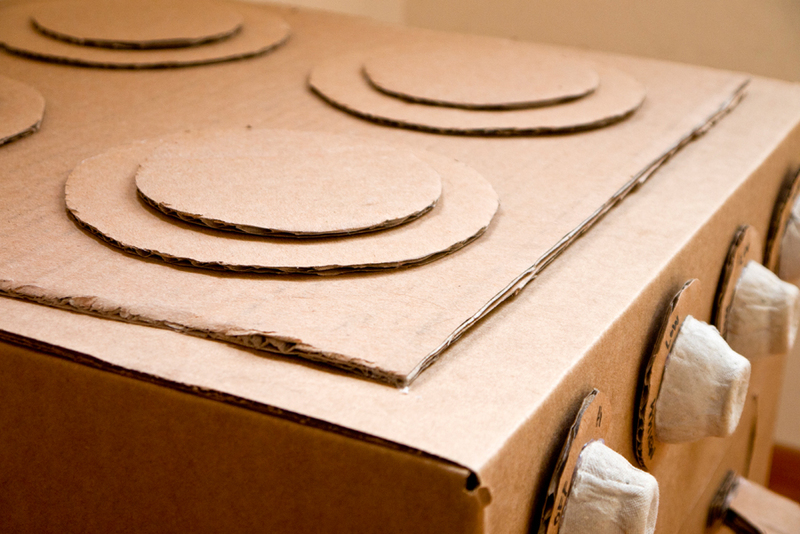 To make your own box oven, you’ll need one 18x18x16 box along with another to use for adding your embellishments. 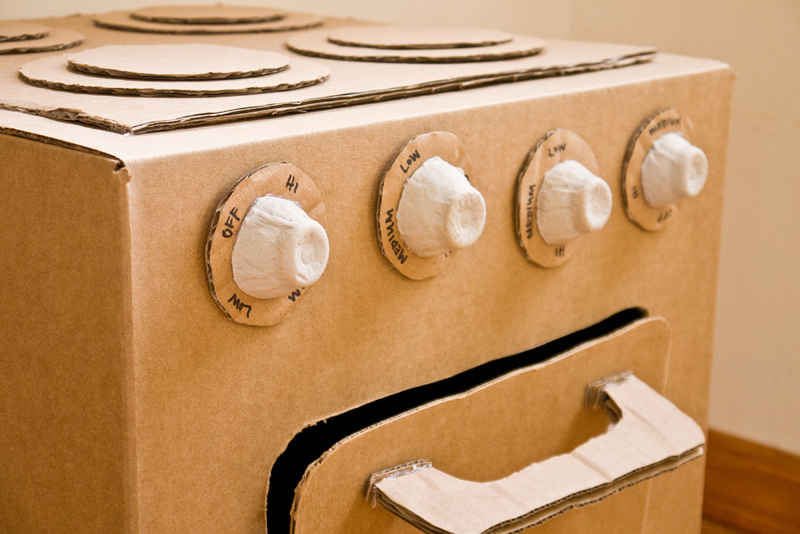 You can make your oven however you like – and add special items for your budding cook. I started by taping one end of the box, which allowed me to still have access to the insides. I traced around a rectangular plate of the tot’s to create the opening for the oven and then carefully cut on the line using a utility knife – but not along the bottom edge. 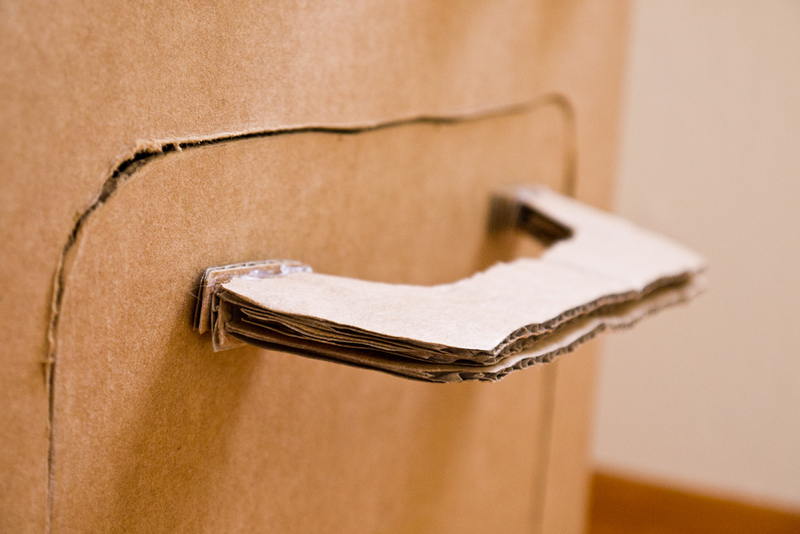 To create the opening, I pressed a ruler along the base of the opening and then folded out the cardboard. Then I used a piece of sand paper to gently smooth the edges. For the handle, I cut one handle-shap from some scrap cardboard and then used that template to cut two more exactly the same. The hot glue gun held them together, and then to the front of the oven door with the help of a few small rectangles to make things more stable. Next up? Cute knobs – that turn! With the help of a few egg cups and pipe cleaners, these knobs were good-to-go. I separated the egg cups and cut four same-sized circles from the extra cardboard. Then, I used a push pin to make two holes in each of the cardboard circles, just like it was a button. Simply thread the rounds with the pipe cleaners (doesn’t matter what color) and then hot glue the tops of the egg cups over the cardboard button, with the pipe cleaner end coming out the other side. Now measure (or don’t) where you’d like your knobs at the top of the box above the oven door. Use the push pin to make holes, thread with the button knobs, and then twist the pipe cleaners on the inside of the box oven, adding a dab of hot glue to make things really secure. I even used a black marker to add cooking temperatures. To create the cook-top, I cut the side off the extra cardboard box and hot-glued it over the top of the cardboard box oven, which made things a bit more stable. Then, I cut four large circles from the extra cardboard, plus an extra four smaller ones to make the burners. Once again, my hot glue gun secured everything in place. Just because the bottom of the box was just a bit low to use when the front of the oven door opened, I cut a length of extra cardboard to fit right under the door when open and also held happily in place with a bit of hot glue. Making the pice just a bit longer makes it easy to fold the sides and then glue in place. This way the tot’s cakes would bake up just right. After taping the bottom of the box, it became apparent that the top of the range would be a bit low. 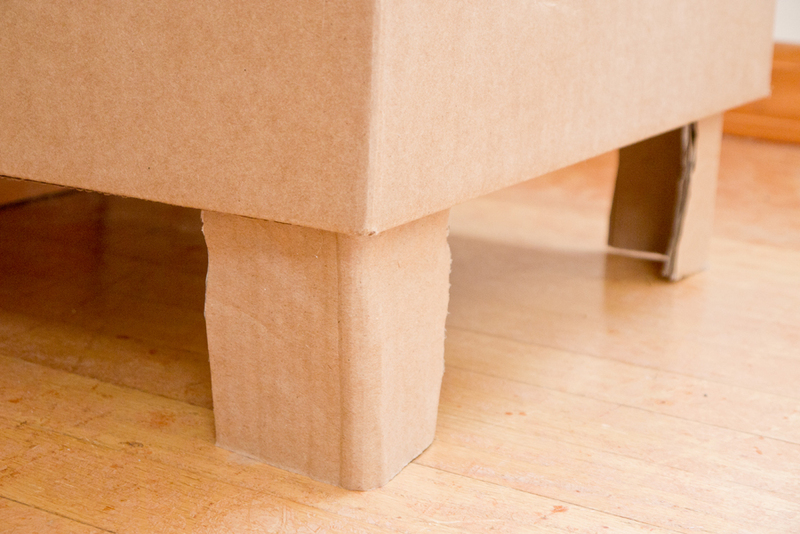 So, with the help of a four folded squares of extra cardboard, I created legs for the cardboard box oven and used that trusty hot glue gun to attach. 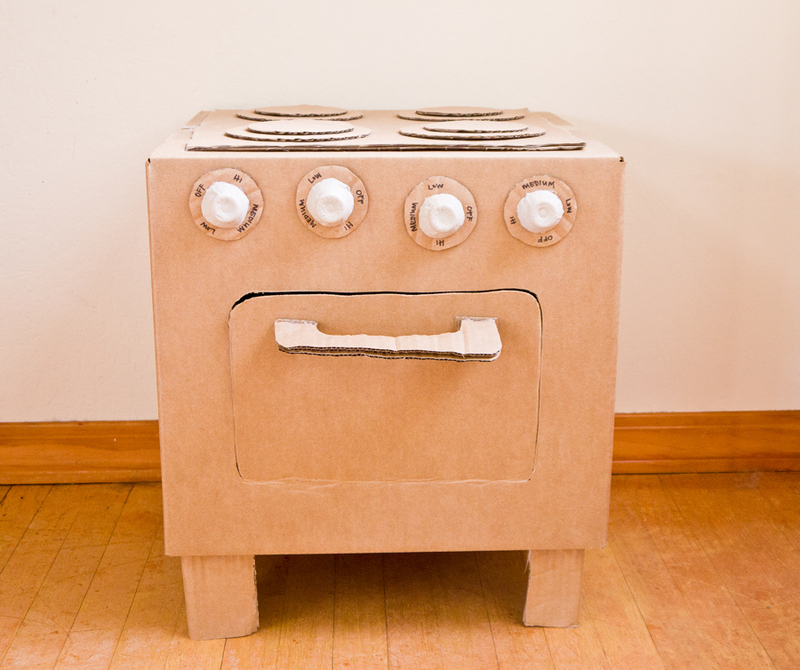 The tot could barely stay away while the cardboard box oven was in production, and the minute she could have at it, she was in love. And what’s awesome is that it cost me basically nothing to make, took just about an hour, and can be hot glued back together when things fall off – or recreated with a bigger box! OH! that looks pretty awesome! Good Job! Great job! 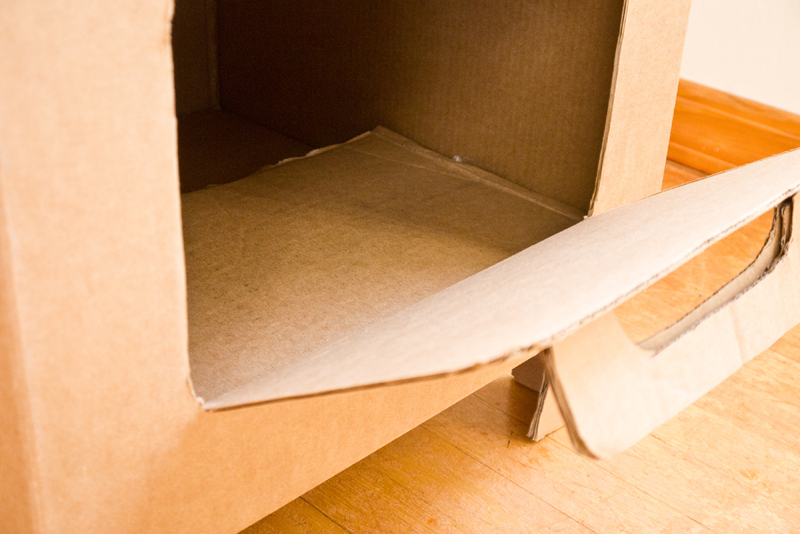 My husband is always getting rid of the cardboard boxes that we get. But you’ve just inspired me to keep the next one…for a fridge I think! Thanks for linking up to the Kids Co-op! Hi! Just letting you know that you are in my weekly showcase! Pop on over and grab your “Featured at Triple T Mum” badge! We go live on 29 March, 9am (Pacific time).